Durban grass/Coast grass/Natal crowfoot/Sweet Smother grass. LM grass is indigenous to South Africa. Found predominantly on the Natal coast and Mozambique. It is a stoloniferous perennial which forms a dense sward and is dark green under ideal growing conditions. It is fairly broad leafed and its leaf margins have a twisted appearance. It performs very well in shady and semi-shade conditions. 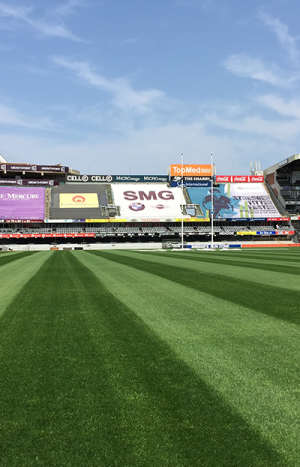 LM grass also performs well in full sun. 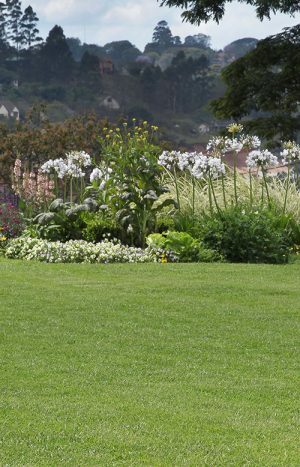 This grass has a creeping growth habit but is far less invasive than kikuyu. LM grass is relatively heat tolerant and can recover from drought and heat stress by means of its creeping growth habit. 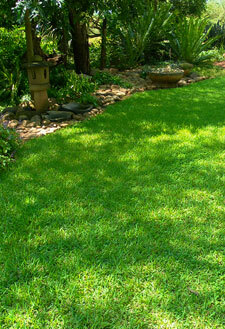 LM grass is well suited to home lawns, office parks, rough areas on golf courses and shade areas. It should not be mown shorter than 30mm in full sun and 50mm in full shade. In frosty areas the grass should not be mown during winter. It avoids cold damage by exposing the upper leave growth to frost. 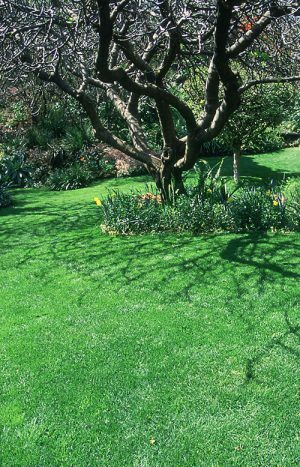 Remove existing grass if the area is in full sun and other grasses were growing there before, it is important to get rid of them properly before establishing a new lawn. The underground runners of creeping grasses can be very persistent so you can’t simply dig it out. Spread Super Phosphate at a rate of 50g* per m² over the entire area (50 g is approx. one medium sized handful) *This is a general recommendation, made in the absence of a soil test. Dig the area over incorporating the Super Phosphate to a depth of approximately 15 cm. At this point you could dig in some compost. This is not generally necessary and can cause problems if the compost contains weed seeds and is not well rotted. Never leave compost as a layer on top of the soil as it dries out far more easily than soil does, and will not allow the seed to stay moist enough during the critical germination period. Compact surface by rolling lightly. Ensure that you have the right amount of seed, i.e. 300g per 100 m². Broadcast the seed over the area as evenly as possible by hand, or by using a drop seeder (a fertiliser spreader will do, as long as you have checked that it does not crush the seed). To achieve an even spread, split the amount of seed in two, moving up and down with one half and across and back with the other. The seed is very small so you can mix it with sand/bone meal to bulk it up. Rake the area lightly (using a steel rake), so that most of the seed is covered by no more than 3 mm of soil. This seed needs light to germinate so don’t bury it too deeply. Also, don’t cover with a layer of compost as it dries out too easily and may prevent successful germination! It is essential to compact the area lightly. If you don’t have a roller, then use something like a drum on its side or simply trample lightly under foot. This step is very important, as it brings the seed into direct contact with moist soil, reduces wash-aways and initiates capillary action (the movement of water upwards through the soil profile). When grass is 6 cm long. Set the mower at its highest setting (no less than 4 cm). Sunny areas 3 to 5 cm (lower heights necessitate twice weekly mowing). Generally once a week (more if cut shorter than 4 cm). Although this is a relatively drought tolerant grass at maturity, it still needs regular watering during establishment. Irrigation can be reduced once the root system is established. Take careful note of the symptoms, i.e. spots on leaves, size and location of patches etc. and phone the MayFord Helpline insert connection or speak to a specialist in this field. Remember that insects and fungal diseases know nothing about straight lines, so if you see straight lines look for a man-made problem! Good air flow reduces humidity and helps to avoid disease. Don’t over water or underwater – both cause stress to all grasses. Where traffic is excessive the pressure can be reduced by setting paving stones or sleepers into the grass and just mow over the top. This is a creeping grass and possess the ability to cover bare patches. Top dressing: Do not top dress.